What Is Avian Or Bird Flu? Avian (or Bird) influenza is an infectious disease of birds caused by the influenza A virus. Birds are the hosts for most avian influenza viruses and a variety of influenza subtypes can be found in birds, particularly in water fowl and shore birds. Domestic poultry are especially vulnerable and the virus can rapidly cause epidemics in flocks. As 2005 began, the deaths of two young boys in Vietnam were overshadowed by the disastrous tsunami that swept across the Indian Ocean. But the boys' deaths, from a strain of influenza known as influenza A H5N1, or 'bird flu', could herald an even greater loss of life. In 1918, a flu pandemic killed more than 20 million people worldwide, and many infectious disease experts believe another flu pandemic could be imminent. The appearance in humans of a type of flu that normally only affects birds may be an important sign that some strains of the virus are changing, or mutating, in a way that could threaten people around the globe. Influenza A viruses occur naturally in wild birds. Although these birds aren't affected by the virus, domestic poultry such as chickens and turkeys are - and so are people. H5N1 has become common among birds in Asia, who shed the virus in their saliva, nasal secretions and faeces. More than 90 per cent of birds who get H5N1 die, and mortality among humans is also high. The H5N1 virus was first shown to have passed from birds to humans in 1997, during an outbreak of avian influenza among poultry in Hong Kong. The virus caused severe respiratory illness in 18 people, of whom six died. New flu strains tend to emerge in Asia, Africa and the East, where people live in closer quarters with their animals, and different flu viruses may mix to cause new strains or pass between species. For example, domestic ducks may carry H5N1 without symptoms and release the virus for long periods, acting as what is known as a silent reservoir. In rural areas, free-ranging ducks and chickens often mingle and share the same water supplies. 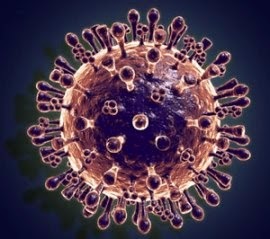 The virus may then be passed from one animal to another and possibly even to humans. More worryingly, recent research has shown that H5N1 has changed so that it's even more deadly in chickens and mice, and can now infect cats too. H5N1 is also resistant to some of the drugs used to treat flu (such as amantadine). Millions of chickens and ducks have been slaughtered across South East Asia in an effort to prevent the virus spreading from birds to humans. A vaccine against H5N1 has already been developed, and others are in development. If H5N1 becomes able to pass from human to human then the situation will be even more serious as most people have little immunity to the strain and there will be rapid spread. The first possible case of human-to-human transmission was reported in Thailand in September 2004. Fever, Sore throat, Muscle aches, Headache, Lethargy, Conjunctivitis (eye infections), Breathing problems, Chest pains. Flu viruses continually alter through small changes in their make-up called antigenic drift and occasional abrupt major changes called antigenic shift. This means that although you may have fought and won a miserable battle against flu a year or two ago, the next time the virus appears your body won't recognise it because the antibodies your body made against flu last time won't work. This is why people need to be immunised against flu each year, using the most up-to-date strains of the virus. There are three types of influenza viruses: A, B and C. Type C only causes mild problems in humans. Type B can cause more serious illness and seasonal epidemics, but as it only changes through the slower process of antigenic drift there is little risk of a pandemic, where millions of people are suddenly exposed to a new, dramatically different virus. That threat is more likely to come from type A, which can undergo rapid shift. For up-to-date statistics on avian flu cases and deaths worldwide, visit the World Health Organisation (WHO) website. The UK flu pandemic contingency plan is available to download from the Department of Health website.